Microinverters: Are they right for your solar system? As the name suggests, microinverters are small inverters for use in solar PV systems, usually installed at a ratio of one per solar panel. By contrast, most solar PV systems in Australia have a single, centralised inverter called a string inverter. What are the advantages of having a solar PV system that uses microinverters instead of a string inverter? Superior performance in shaded conditions and/or situations where one or several panels are producing less power than others (think: bird poo or fallen leaves). They are also better suited for oddly-shaped or gabled roofs, where panels are installed at different angles and orientations. Higher overall solar system yields compared to string inverter systems installed in comparable conditions. Microinverters really shine in situations where shading is an issue, but they can also deliver higher overall energy yields compared to string inverter systems in situations where conditions (orientation, tilt angle, access to sun) are ideal. No single point of failure – if one microinverter (or panel) fails, the rest of the system will continue generating electricity as per usual. By contrast, if a conventional string inverter goes down, it takes the whole system with it – producing no electricity at all. Longer warranty periods than string inverters: Because they are located on roofs, embedded in or installed behind solar panels, microinverters must offer superior reliability than string inverters, which are generally easier to access. Standard warranties for microinverters tend to be 10-25 years – 10 for when they are installed on the racking and 25 for instances when they are embedded in the panels directly. 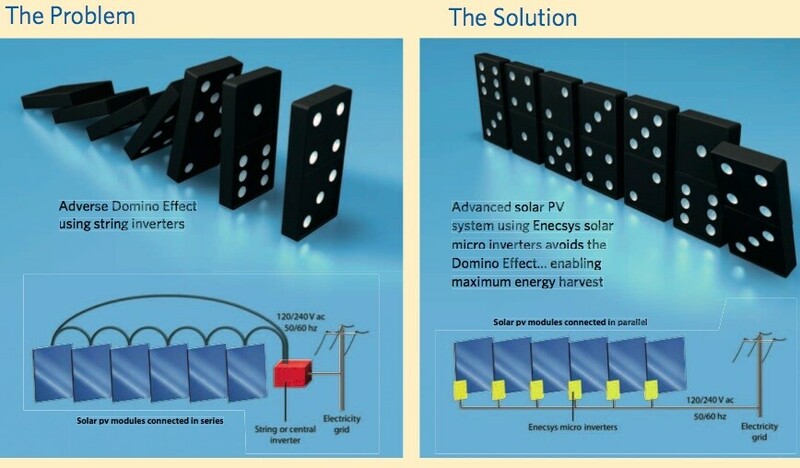 A diagram from (now defunct) microinverter manufacturer Enecsys illustrating the benefits of microinverters in situations when shading or malfunction of a single panel occurs. With a string inverter, system output can drop significantly in such situations, while output will drop less with microinverters. ‘Enphase’ is not synonymous with ‘microinverter’. At the time of writing, Enphase Energy is pretty clearly the dominant player in the microinverter space – but it is not the only one. Most major string inverter manufacturers (SMA, ABB/Power-One & Samil among others) also have microinverter options alongside their standard offerings. Besides Enphase, companies who specialise in microinverters include SolarBridge (now owned by panel manufacturer SunPower) and APSystems. Like microinverters, power optimisers are small and usually installed at a ratio of one per solar panel. However, unlike microinverters, a central inverter is still required to convert the DC electricity from the panels into usable AC electricity. The job of the optimisers is to condition the power produced by the panels so be as friendly to the inverter as possible – thus maximising overall solar system energy yields. SolarEdge and Tigo Energy are the two main makers of power optimiser solutions. SolarEdge systems must use a SolarEdge inverter, while Tigo’s optimisers are compatible with a range of popular 3rd-party inverters. Power optimiser manufacturers tend to argue that optimisers are better to have on a (potentially very hot or wet) roof than microinverters because they contain fewer working parts – the job that they do is relatively simple, and what they can’t do is done by the central inverter, which is ideally installed in a location less exposed to the elements. Like microinverters, power optimisers promise overall higher energy yields than string inverters, as well as module-level performance monitoring and superior performance where shading is an issue. Unlike microinverters, power optimiser systems use a central string inverter – meaning that they have a potential single point of failure. If the inverter fails, the system will cease to produce any energy. Online monitoring portal screenshot for Solar Choice managing director’s 22kW solar system in Kangaroo Valley, which uses Tigo power optimisers. SolarEdge’s power optimiser system architecture. What are the downsides to microinverters? Microinverter technology has been on the scene for decades, and there are a number of companies that manufacture them. But when solar PV began its global boom as a power source several years ago it was string inverters that were taken up as the bread-and-butter option. Despite their advantages over string inverters, the conventional wisdom about microinverters is that they are more costly and more prone to failure because of their greater numbers and location in harsh rooftop conditions. It’s worth questioning, however, whether this thinking about microinverters is outdated – even if it eventually turns out that these assumptions are false. 1. Are solar systems with microinverters really more expensive than string inverter systems? Solar Choice has been tracking average solar PV system installation prices since August of 2012, but our monthly articles do not include pricing data for systems with microinverters. In Australia, microinverters are generally viewed as a premium product warranting a higher price tag. Interestingly, one of the purported benefits of microinverters (in marketing literature aimed at installers) is that they reduce labor costs by cutting down on installation time. Another is that they can theoretically be more cost-effective in smaller systems (up to about 3kW) – at which point pricing starts to tip in favour of string inverters. We had a look at microinverter system pricing for Brisbane at the time of writing to see how microinverter system installation prices stack up against standard string inverter system prices. Of a sample of three installers, microinverter systems were on average $0.42 per watt more than string inverter systems (as per Table 1 below). The prices are for a range of microinverter/power optimiser offerings, including Enphase, APS and SolarEdge. 2. Are microinverters less reliable than string inverters? This is question is posed because of the relatively harsh conditions in which microinverters must operate: sun-baked Australian rooftops, behind hot solar panels. This question is a bit more contentious and harder to answer with hard data from the field (although I invite those who have data to offer it up in the comments section). We could, however, approach it philosophically. In Australia the two major microinverter players are Enphase and APSystems. Both offer 10-25 year warranties on their products, which are accredited by the Clean Energy Council. This indicates that they they are designed to operate in rooftop conditions and should be reasonably reliable – and if they’re not, they will be replaced (check the terms of the warranties for replacement-related costs). Most string inverters have warranties of 5-10 years and can similarly be counted to function well during that warranty period in most instances. However, in the instance that a failure does occur, would you rather a) lose the power output from all of your solar panels until it is fixed, or b) see a dip in overall system output until the faulty component is replaced. If you prefer option b (as most people would), then a microinverter system is probably the better option – and potentially worth paying a bit more for. Want to see current pricing for microinverter & string inverter solar systems in your area of Australia? How does the micro inverter arrangement deal with charging battery storage? I take it that you have to install an ac-dc charger? Have normal house requirements including a 6Kw Heat bank and want to optimise generation hours in June, figure if I can do this the rest of the year will be a breeze. To do this I have been quoted on 6 east facing panels, 6 west facing Panels 18 North facing panels. This is slightly bigger than your Table above, comparing Micro invertor & String invertor in Brisbane. Am I correct to think Micro Invertors would be cheaper in my situation as I would need 3 string invertors !!! because of thee orientation of panels, East, West, & North. Am I dreaming ? 2 different panel array orientations is not a huge problem for a single inverter with two separate MPPT inputs, and 3 may even be possible in the right circumstances. Alternatively, you might even be able to get 1 central inverter with inputs from 2 arrays, and then a 3rd panel array on microinverters or a separate central inverter. Microinverters will not necessarily be our cheapest option – while they’re indeed better with partial shading and multiple roof orientations, string inverters are generally more affordable. Hi, we have Sanyo Hit solar panels and sunny boy inverter (string), we are thinking of adding more panels, LG and microinverters, will the two systems work together? What is the best thing to do? Please advise. One of the easiest ways to add more panels to an existing system is to simply add more panels with microinverters. Since microinverters function independently of one another, their output and performance won’t have an impact on other panels/inverters on the house (provided of course that they’re not installed in such a way that they’re shading one another). The main downside is that if you currently use some kind of app-based monitoring system for your panels, you’d probably now need to to monitor overall system performance (one for each inverter brand). Hope this helps! If you need quotes for a system that is at least 1.5kW in capacity, feel free to fill out our Quote Comparison Request form. Further to my previous posts, we still haven’t had our faulty panels replaced by Canadian Solar yet. We’ve exchanged over 100 emails trying to get them replaced and they finally sent out replacement panels with the wrong connectors on them and have told Green Valley Solar who are looking after my system to cut and rejoin the cables. That’s definitely a bad situation and sorry to hear you’ve had so many issues. Hoping that the system is up and running as you would ordinarily expect it to be at this point. Ive been researching for our home and have come to conclusion need multiple inverters due to living close to ocean birds poo salt in air etc plus next door Greenie’s trees huge and need facing west front plus can use east back house for panels – north his trees and ocean. Had quotes but all for 3kw string – taken for granted . Phoned one in Devonport Tas along the coast form us, he said not got batteries yet but do multiple and can fit battery later when avail. Cost around $15K. Most in line round up to $5K. But we are home all day, and use off peak storage too so want storage or ability to use night cheaper power as we already pay 75% higher tariffs due to RET and only going to get worse we will pay for use of diesel due to Labor flogging off our power 2010-12 and no reserves and drought. So can only go up. So also need to know re batteries where kept and if safe some aren’t I think from forum remarks. Anything you can tell me gratefully rec’d included how long to install and where. Just had meter box updated but would like what Bob above said ability to see if one panel failed. My last bill is for all up 1040 Kw units. Thats power and off peak combined. Dont have hot water. Use more in next 2 quarters with 2 off-peak storage heaters on. So need to be able to use these these heaters fm April to December some years. Please give us a call if you’d like to discuss your options – 1300 78 72 73. We have lots of installers in our network who offer microinverter options. That being said, if there are tall trees to the north of your house, it probably won’t matter if you point your panels east or west – they’re likely to still end up with some shade on them if the trees are tall enough. And yes, battery storage is still expensive – keep an eye out for costs to come doing in next year or two. Best of luck with your system (if you get one)! I have Enphase micro inverters and so far am very happy with them. The software that comes with them is brilliant, enabling you to track all that is happening with the system. So far they’ve enabled me to pinpoint 2 failed Canadian panels over the last 2 months and prove that the panels were at fault and not the inverters. My sytem was less than 12 months old at the time of these failures. The Enphase system enables you to track the performance of each panel over its lifetime. How do people with string inverters ascertain they have faulty panels and if so, which ones? Glad to hear you’re happy with your system. For systems with string inverters, there is no way to directly identify if/where there is a problem with a solar panel (unless it’s something visually obvious like a cracked or broken panel). Instead, they’d see a drop in output from their system, and it would be up to someone with technical expertise to ascertain which one (or ones) is faulty. Clearly, the ability to monitor the performance of individual panels is one of the advantages of having a microinverter system! I should also note that Tigo and other optimisers also allow system owners to ‘see’ which panels are underperforming, as well as help to mitigate the severity of the drop in output due to the failure of a single panel. Thank you. That means there are probably a significant number of homes which have faulty panel/s and if they’re seeing lower output would just think it’s been extra cloudy and never realise they have a problem. Not good. The manufacturers must hate micro inverters.